We commit ourselves to grow in faith, affirm our gifts, support one another in our callings, engage in ministry and action, and promote healing and wholeness in the church, the society, and the world. We, as diverse women of God, respond to God’s love by sharing the Gospel, cherishing creation, and encouraging each other’s growth in faith. Ever wonder what our Alaska SWO logo means? The meandering river that supports the water lily represents the diversities and distances we conquer in Alaska as we strive to do the work of our Lord and Savior Jesus Christ. 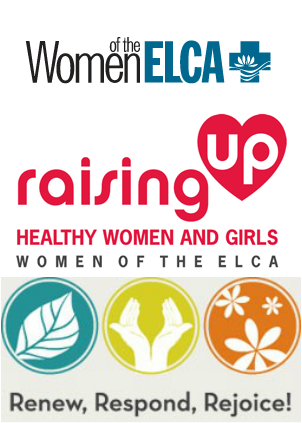 You can visit the Women of the ELCA's website here. Alaska Synodical Women's Organization is committed to reducing hunger, especially through advocacy and education. Learn more at the ELCA World Hunger Page. Also, for help in letter writing campaigns to reduce hunger, please visit Bread for the World at www.bread.org. Café is an award-winning Web-based magazine for young women who want to build Community, participate in Advocacy, strengthen Faith, and strive toward Enlightenment (CAFE!). It incorporates a Lutheran perspective for women of Christian faith or simply for any woman who is interested in how faith can relate to the issues that women face today.